Colorado is spa country. There are several great hot springs spas in the state and we may need to visit all of them. So far we have been to three, Glenwood Hot Springs–huge pools–lots of locals; Mount Princeton Hot Springs–mostly adult access except for their public side but a very nice family cabin; and Pagosa Hot Springs, over 20 smaller soaking pools of various temperatures, plus a nice large swimming pool and all located right next to the river. Beautiful and friendly, probably my favorite so far. So to emulate these treasures at home, many folks have hot tubs. They are to Colorado what swimming pools are to Arizona–in most backyards. 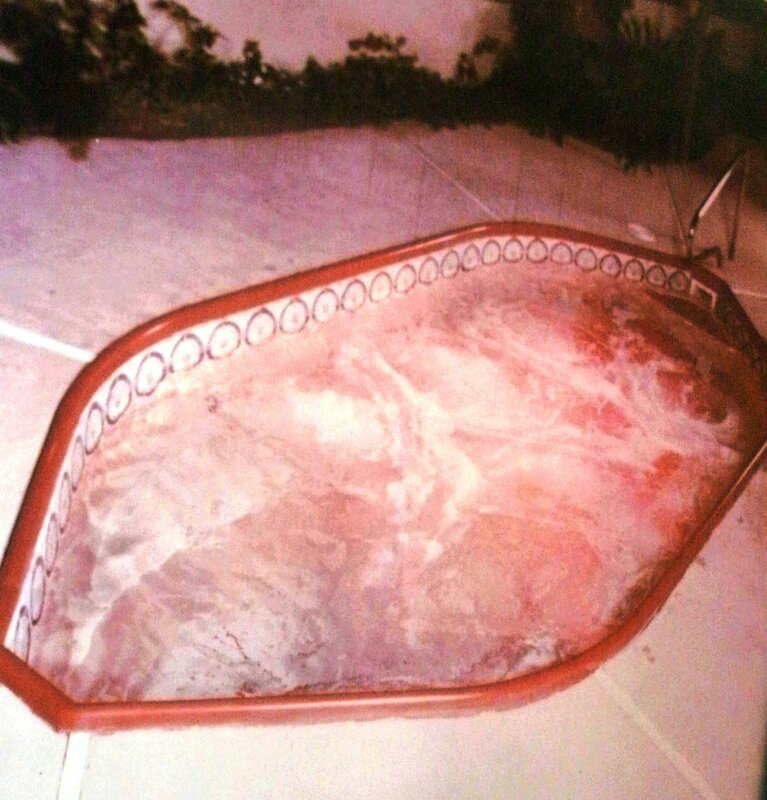 I always wanted a hot tub in addition to our pool in Arizona but we never bought one. Didn’t really fit into the yard very well there but we have tons of yard in Colorado. I shopped on craigslist for a long time looking at everything from free to a fortune and got to thinking I’d like a swim spa instead of a hot tub. The other day I was looking and saw a posting that was only an hour old–and I called. It is an exercise spa, not quite long enough to swim in but deep and with a good jet system on one side. About 20 miles away but just off the highway so not in the boonies or far up in the mountains. An elderly couple (more elderly than me) were selling their spa because the lady’s arthritis and his bad knees have meant they cannot climb into and out of it anymore. Actually buying advice for hot tubs say NEVER buy a spa that has been emptied and you can’t see operational. So that is what I am doing. There is something about this couple and this spa that seems right, despite all the effort it will take to get it moved and installed. It is a Rio Spa–I was lucky to read the website before it went down. The founder was an early manufacturer of swim spas, Carl Meyer and his wife Carol, and claimed to have built some of the first, if not invented the concept. I found at least a couple of fiberglass pool patents under their names. They used to make slides and other fiberglass pool accessories but sold most of the business several years ago, retaining only the swim spas. Now there are so many other swim spas on the market and Rio stopped manufacturing sometime in the last couple of years. They don’t respond to inquiries and the website just became unavailable this week. I’ll post in resources the documents I downloaded before it went away. The Facebook page is still there and the last post is in 2012. There is another vendor online that makes Aqua Swim Spas to the same dimensions but they also didn’t respond to my inquiry. So the line is no longer made but I’m confident it was well-regarded product for a long time. 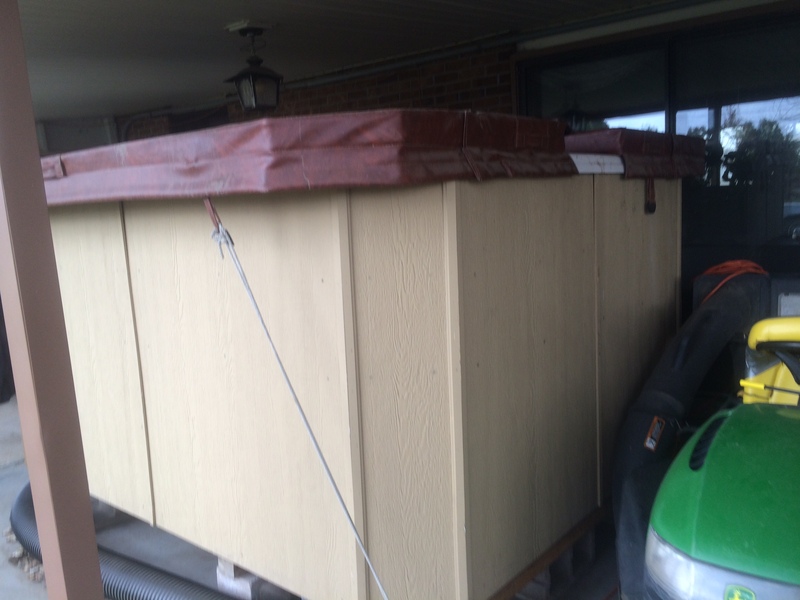 The shell is very similar to a fiberglass pool and it could be installed in the ground, but the couple purchased the support frame for above ground installation. It has a wood skirting around the frame but because it is so tall it is not the typical redwood cabinet. I tried to talk myself out of buying this spa several times but each time I kept coming back to the idea of owning it and working with the couple who I liked as soon as I met them. Today I drove out there and put down a deposit. So here is the diagram of the model. It is 9.5 x 7.5 in dimensions and about 8 x 6.75 at the water surface, it has steps on one side and slopes in so that it is a 4.5 ft. square at the bottom. Steps are integrated into the side for access and the couple has a step system to enter from the outside. The handrail is not included, however, this gives a good idea of the design of the spa. In 2009 when they bought the spa, the equipment it came with was made by Acura–that is a pretty good name in spa equipment. And they have an online store with replacements for anything in the mechanical system. 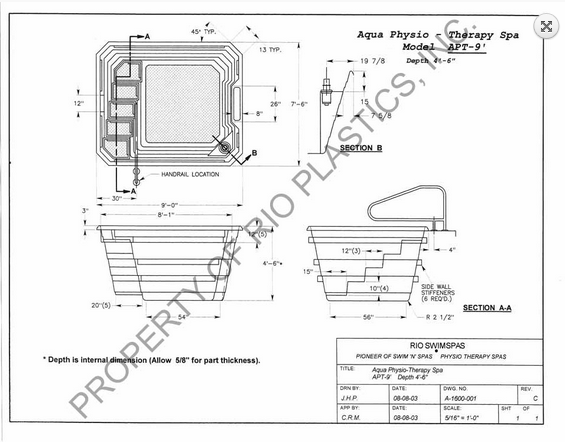 And this is another diagram of the interior and exterior–actually from the Aqua Swim Spa site instead of the Rio site, but the tub is the same although it does not show the filter. Now we have to get started on the cement slab and contact the movers to set a date. Once the electrician gets the new box in and runs wire, we will have an unusual spa that I hope will last us many years.